There's more going on here. It's not a coincidence that the industries involved in the creation of this new genre just so happen to be the very same companies that initiated the exceptional levels of cross-media integration found within children's culture since the 1980s. 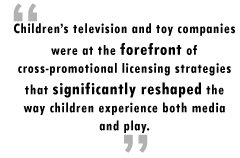 Then, as now, children's television and toy companies were at the forefront of cross-promotional licensing strategies that significantly reshaped the way children experience both media and play. In the deregulatory climate of the Reagan administration, new partnerships were made between toy companies and the children's television industry, establishing what would soon become the prototype for cross-media synergy. These partnerships consisted not just of licensing agreements but full-fledged collaborative ventures, wherein programs were designed from the outset to promote a line of licensed toys. While not an entirely new concept, the levels to which the previously distinct industries of television production, toy manufacturing and advertising became able to coordinate their efforts were unprecedented. As a greater array of media formats and product categories entered into the mix, children's culture became dominated by properties engaged in transmedia integration. Film theorist Marsha Kinder calls the process "transmedia intertextuality ," in that each incarnation of the text not only extends its overall reach but also expands it: contributing new or alternative storylines, character development and so on. Each text promotes the other texts and any associated tie-in merchandise. When viewed in this context, MMOGs simply represent the latest in a string of frontiers to be colonized by transmedia integration. Yet MMOGs are also forms of play, which puts them in a different category from television or comic books. Like licensed toys and previous forms of licensed videogames, MMOGs represent something of a hybrid, bridging the gap between narrative and play. And because play is such an important part of childhood, the expansion of media brands into its content warrants special attention. Previous collaborations between toys and the media have been enormously successful. In 1985, television licensing made up 40-50 percent of all toy sales, a market share that continued well into the 1990s. By 2003, a study conducted by the Kaiser Family Foundation found that nearly all American children (97 percent) under the age of 6 owned toys and products based on characters from television and film. The meteoric rise of licensed toys has attracted a lot of attention from child psychologists and media scholars. The main issue is whether or not the toys' associations with media affect the way kids play with them. While the research is inconclusive, studies have shown that in certain circumstances kids will stick pretty close to the scripts provided by media when playing with licensed toys. This is especially true for toys that have deep media linkages and those with highly specified (and therefore limited) features. Variations in kids' play experiences suggest that while licensed toys create a bridge between media and play, this relationship is in a constant state of flux. It's also a process kids themselves will contribute to wherever there is an opening.